The ideal "Hi-Lo" drinking fountain for all season outdoor use even where temperatures drop well below freezing. 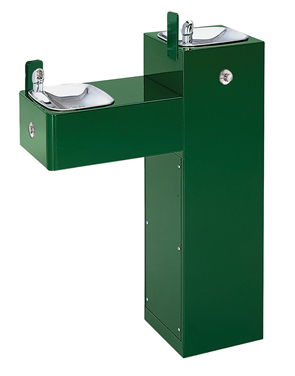 Model 3300FR is a Freeze Resistant, "Hi-Lo", pedestal drinking fountain constructed with heavy-duty 11 gauge fabricated galvanized steel with powder-coated finish providing exceptional corrosion and vandal resistance. Haws heavy-duty pedestal drinking fountain 3300FR uses a freeze-resistant valve assembly (sold separately) to provide year round outdoor operation. Fully engineered pneumatic valve assembly is one of the best in freeze-resistant technologies. The "Hi-Lo" barrier free design of the 3300FR allows the square pedestal to be placed securely in multiple locations, all while providing for twice the users as regular drinking fountains. Model 6518.2FR is a fully engineered system with pneumatic operated freeze resistant bury valve installed below frost line, with check valve to drain water from unit when not in use and to prevent back-flow cross contamination. Applicable for 2 Bubblers. Equipped with vandal resistant components, this fountain is not easily disrupted, quickly discouraging the worst of vandals. Featuring chrome-plated brass bubbler heads with steel guards to deter damage, steel access plates with vandal-resistant screws, and vandal-resistant waste strainers. Additional features include 20 gauge Type 304 Stainless Steel bowls, recessed push buttons, push button activated pneumatic freeze-resistant valve system, four internal bolt holes provide anchoring for pedestal. Anchor bolts are furnished. Now Requires the 3300FR or 3300FR-CC and one of Valve Systems (Model 6518FR) Listed Below (Sold Separately) for a Complete Unit. Model 3300FR - Square Pedestal (Freeze Resistant) "Hi-Lo" Drinking Fountain. 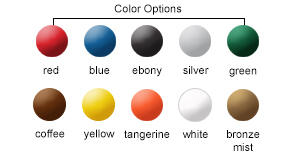 Model 3300FR-CC - Custom Color Square Pedestal (Freeze Resistant) "Hi-Lo" Drinking Fountain. Model 6518.2FR - Valve System (Freeze Resistant) fully engineered pneumatic operated valve Applicable for 2 Bubblers.